This column relies heavily on reader input: Nearly 1,500 suggestions over the weekend (some of which were redundant, but still ... ). Since it was impossible to give everyone credit without destroying the flow of the column, let's just call this one a group effort. If the Pulitzer Committee ends up calling, I'll share the award with everybody. And thanks to everyone who took the time to write in. I shied away from historical examples (like Stalin deporting Trotsky, or Germany's response after World War I), only because that's probably a whole other column. And I'm not the one to write it. If it seems as if there are too many wrestling examples, that's only because most wrestling story arcs hinge on somebody seeking vengeance. In fact, once we entered the mid-'90s, that was EVERY wrestling story arc. So I concentrated on the classics from the '70s and '80s that set the tone. And if you have something against wrestling ... well, I don't care. MJ's got his imprint all over the Vengeance Scale. 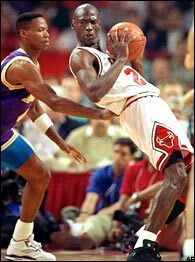 MJ appears on the Vengeance Scale a whopping eight times. If that doesn't tell you why he was the greatest NBA player of all time, I don't know what does. The Corleone family is represented a whopping five times. If that doesn't tell you why "The Godfather" was the greatest movie of all time, I don't know what does. I'm sure we missed a couple. So be it. 0.0 -- Rocky Balboa beating up Tommy Gunn. 0.1 -- O.J. Simpson's valiant attempt to find the "real killers." 0.2 -- The rest of the Rockets after Rudy Tomjanovich was clocked by Kermit Washington ... the rest of the Yankees after Pedro threw down Don Zimmer ... the rest of the Dodgers after Juan Marichal swung his bat against John Roseboro's head ... Rangers fans after the Bruins charged into the stands at MSG in 1979. 0.3 -- The immortal Frankie Williams after Roddy Piper cleaned his clock on "Piper's Pit." 0.4 -- KG's reaction to Anthony Peeler's elbow to the stomach in the 2004 Playoffs ... Kurt Rambis' reaction to getting clothes-lined by Kevin McHale in the '84 playoffs. 0.5 -- Marvin Hagler disappearing to Italy after losing the Leonard fight ... the '91 Pistons storming off the court before the end of the Bulls series. 0.6 -- Vin Baker after getting waived by the Celtics ... Shawn Kemp after getting traded from Seattle ... Drew Bledsoe after leaving the Patriots ... Emmitt Smith after getting dumped by the Cowboys ... Dominique Wilkins after getting traded by the Hawks. 0.7 -- Marty Jannetty after being thrown through a plate-glass window by Shawn Michaels ... Robin Ventura charging the mound against Nolan Ryan. 0.8 -- Mike Piazza's reaction after Clemens threw the bat at him in the 2000 World Series. 0.9 -- Shawn Estes' attempted plunking of Clemens the following summer.